Copper Transformers consist of mixed transformers, free of aluminum windings and other attachments. Transformers have a scrap metal value, due to their copper windings. Copper transformers come in different sizes and can be found in power supplies, microwaves, circuit boards, power lines, construction sites, and others. 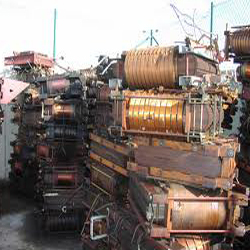 Copper Transformers are considered to be valuable scrap materials due to their copper content and can be sold to scrap yards and dealers, usually by the pound.